The strip mall is still on Barrington Road in Streamwood and 29 years ago on March 26, 1986 the Break-Away Lounge was a staple in the mall. And on that day, amazingly enough, actor Michael J. Fox was in town filming a new movie. Fox was 24 years old at the time and had already released his top-selling movies, Back To The Future and Teen Wolf the prior year. So, the fact that he was on Barrington Road filming scenes for a new movie was BIG news for local residents. The Break-Away Restaurant and Lounge opened around 1977 at 116 N. Barrington Road. In the early days they were open for lunch and dinner as evidenced by an ad from October 12, 1979 in the Daily Herald. They offered lunch time delivery and “Lunch Time Entertainment” that featured a Fashion Show on Wednesdays and Fridays. At that time they also had live entertainment on Wednesday through Saturday evenings, along with a Friday Fish Fry. In 1984 the owner was listed in a September 20 issue of the Daily Herald as John Cartuccio and the name of the bar had been shortened to the Break-Away Lounge. It was reported that Mr. Cartuccio generously opened his bar to Nebraska Cornhuskers fans on Saturday gamedays and, in what we would consider a very low-tech time, carried the game broadcast through a piped in phone line on the bar’s sound system. So, no video. Just audio. Doesn’t that take you back?!? Two years later in 1986 Michael J. 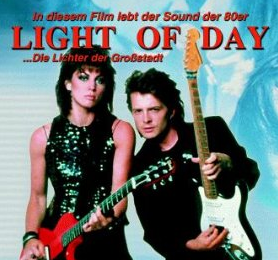 Fox and Joan Jett were in town filming scenes from their new movie, Just Around the Corner To the Light of Day. Apparently the film crew slipped into town without much notice and very little hoopla. Jack Buttitta, president of the Streamwood Chamber of Commerce, said town officials were unaware of the filming “until the last minute.” Not too surprising since they were only there a half a day. The following weekend the Break-Away was back to having live, local music acts like top-hits band Schome and easy rock band Justin Case on Fridays and Saturdays. But, they certainly had their moment in the sun! And, in case you’re interested, the movie title was shortened to The Light of Day and was released in 1987. It’s based on a song written by Bruce Springsteen and performed by Joan Jett and Fox in the movie. To this day, according to Wikipedia, Joan Jett continues to perform the song in her concerts. In fact, it is the highlight of her concerts. Plus, Springsteen featured it quite a bit in his own concerts after the release of the movie. The movie may not have much of a following but that song sure does! Just as the band Cheap Trick was getting its start in nearby Rockford in 1973, the B. Ginnings nightclub of Schaumburg came along to give them a stage. Opening in 1974, B. Ginnings was begun by Danny Seraphine, the drummer for the band Chicago. 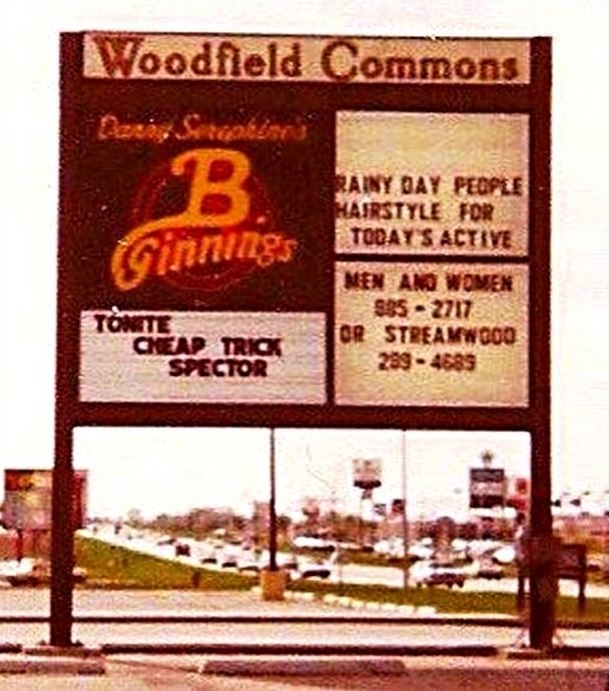 This wonderful photo, passed on to me by blog reader, Larry Rowan, shows the sign for Woodfield Commons. If you’re wondering where the nightclub was, just put yourself in the Secretary of State’s Drivers License facility on Golf Road. You’d be standing in the middle of it. 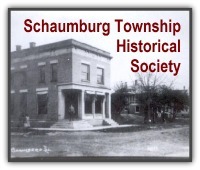 Other nightclubs have also had their heyday in Schaumburg Township. Some had dancing, some had live music and some were just a great place to spend a weekend night to see and be seen. Confetti could be found at 1850 E. Golf Road, adjacent to the Hyatt Hotel.They offered a complimentary dinner buffet, Ladies Night, had a dress code and stipulated that you had to be 21 with proper ID. There was Studebaker’s which could also be found in Woodfield Commons. It had a good-sized dance floor with music that leaned towards classic rock and roll. It was opened by Walter Payton and a group of investors who followed on the heels of that success with another venture–Thirty Fours. This bar opened in 1988 and closed in 1995 at the same location as Confetti. It was very popular and had a great dance floor too. After the closure in 1995 it reopened as Phroggs and had the same amenities as Confetti except that it was necessary to be 23 to enter. A later incarnation was called the Living Room. Hot location, wouldn’t you say? Of course, there was also the Snuggery on Algonquin Road which was a huge hit during the 1980s and into the 1990s. Further east on Algonquin, near Rte. 53 was La Margarita. They were known for their Mexican food but became a nightclub in the evening and were open until 4 a.m. There was also the Bamboo Room on Golf Road between Roselle and Plum Grove. It closed in 2007 and became Heat. Maybe you can remember others that were your hot spots? Or that came earlier in the 1970s? Please share any I’ve missed. And, if you’re interested in a nice history of B. Ginnings, check it out here. According to the Chicago Tribune, when the club opened it catered to a “chic, monied, suburban crowd, over 21.” In 1975 the at-the-door admission was $2 and beers sold for 20 cents before 8 p.m. and $1.25 for mixed drinks. Jam Productions did the bookings for the club and brought in many up-and-coming groups. Seraphine wasn’t always happy with the bands that played at B.Ginnings, preferring jazz-fusion to unknowns like Cheap Trick. Many Chicago and Midwest bands such as Pentwater, Pezband, Skafish, The Boyzz, and the Cryan’ Shames played the club, as well as upcoming major bands like Van Halen, AC/DC, The Police, John Mellencamp, and Devo. Mismanagement and employee thefts hampered the club at first. Seraphine couldn’t understand why the club wasn’t making money despite being packed night after night. There were also allegations of mob involvement in the club, which Seraphine calls “ridiculous.” Seraphine eventually bought out his partners and brought in new management, putting the club on an even keel. Seraphine at one point even considered opening a chain of B.Ginnings around the country. By 1980, with the changing of musical styles and a raise in the drinking age, the club was falling on hard times. While the club hosted many “New Wave” and “Punk” acts, the suburban location and lack of public transportation (and high gas prices) made B.Ginnings hard to get to for fans of this music and many of the local suburban fans had different tastes in music. Even Seraphine admits that the suburban location was “the one thing working against” the club. 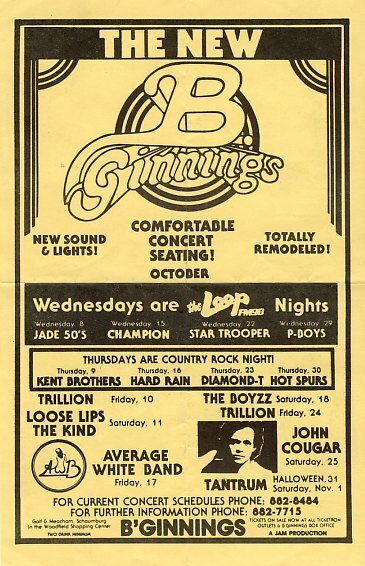 B.Ginnings dropped its rock and roll image to focus on becoming an “adult -orientated concert-style facility” with acts like Robert Palmer and Eddie Money and was renamed New B.Ginnings. (Billboard, 27 Sept. 1980) In that year the club was even hosting mud-wrestling shows to fill the venue. The 1980 opening of Poplar Creek in Hoffman Estates also helped to lead to the club’s demise despite a recent remodeling and attempts at innovations such as adding video. The club was sold in early 1981 and renamed J Lennons, but was soon closed. The space is now an Illinois Secretary of State driver’s license facility. What do you remember about B’ginnings? Were you fortunate enough to see one of the up and coming bands? Was it really crowded on the weekends? What was the restaurant like? Please feel free to share your memories about this piece of pop culture in the northwest suburbs!